This book is a devotional, meaning it contains rituals, meditations, poetry, and so forth to honor the goddess. 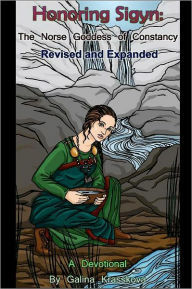 Its full title is Honoring Sigyn: the Norse Goddess of Constancy, A Devotional. Much of this book was previously published as Sigyn: Our Lady of the Staying Power. Krasskova writes with an easy style, so readers of all levels can focus on the content. As is usual with devotionals, readers will connect better with some of the suggested devotions than others. That is par for the course and does not detract from the book’s overall usefulness. This is the most complete source of information on Sigyn so far published; therefore, I recommend it for anyone interested in Sigyn. This is not an academic work, but it does start with a roundup of the known lore about Sigyn, e.g., her story and her names. Since not much about her has survived from heathen times, this section is short. Because this book is the only place that all this lore has been collected, other than the earlier edition of this same book, it’s where the academically-oriented will inevitably look to understand Sigyn, even though this book is aimed solidly at devotional polytheists, heathens, and pagans who want to worship her as well as understand her. As with other devotionals, this book contains suggestions on things to do to honor Sigyn, as well as personal stories of how her devotees relate to her. The look inside the world of Sigyn’s people is unique among publicly available sources, and is a great introduction for anyone wanting to understand her humans as well as herself. The poetry is excellent. I loved the essays in which people shared their gnosis, opinions, and experiences. The meditations are clearly laid out. Their purposes are easy to understand, and the instructions easy to follow. I did not really relate to some of the meditations and rituals, since I’m not a mother and don’t relate to that aspect of Sigyn. One of the rituals that did address an aspect of Sigyn I relate to, that of caregiver, contradicted my own gnosis in a way that horrified me. Because of a dream I had as a child, and the personal practice that I developed out of that over the decades, the idea of a worshipper trying to substitute herself for Sigyn shocked me. I see the role of the priestess or shaman very differently than that. Also, I cannot imagine Sigyn would want the people who love her to suffer; I see her as coming to us to relieve human suffering because she understands it because of her and her family’s experiences. That was just one of the many rituals, meditations, and so forth, though, and as with other devotionals, readers can take or leave each of the various things in it. There being just one ritual in it that I wouldn’t want to perform does not detract from the book as a whole. I definitely want to try some of the recipes. The fig cake looks delicious. I would make these just as recipes, not necessarily as sacrifices to Sigyn. There are so many great looking recipes, even those who don’t really want to devote themselves to Sigyn but are just interested in reading about goddesses might want this book to read to increase their general knowledge of goddesses, and to keep just as a cookbook. Along with recipes, there are also sections on doing housework as a devotional activity. I understand the concept of doing chores mindfully, as with zazen in Eastern practice, but since I already associate cooking, cleaning, and so forth with other deities, I just don’t connect those things with Sigyn. This devotional activity centers on Sigyn as hausfrau. Since most of Sigyn’s devotees are young mothers, most people interested in Sigyn will relate to that aspect of her. The devotional for Narvi at the end of the book is a special bonus. The poem for him is lovely. The story of the woman who gave Narvi experiences as a devotional act is really sweet and tugs on the heartstrings. That story also gives an example of a type of skinriding by a deity other than the type some traditions call horsing, so it adds to the written knowledge about different types of pagan and heathen practices. I really liked the conclusion of the book, after the list of recommended books, where Krasskova sums up the heart of devotion as an attitude rather than a list of specific rituals. This book was published before the recent butterfly movement, so it does not contain any butterfly or gardening related rituals or information. However, it is still an excellent source for both the general reader interested in honoring Sigyn and the academic reader interested in understanding her and the modern practice of her devotees. I highly recommend this book for anyone interested in Sigyn.